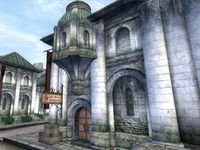 Luther Broad's Boarding House is an inn located in the Imperial City's Elven Gardens District. It is found across the street from The King and Queen Tavern and Roderic Pierrane's House and next to Dovyn Aren's House. The publican, Luther Broad, buys potions and food while only selling the latter. The ground floor contains the main reception area consisting of a bar and a counter and a dining room while the rooms are upstairs. The room you can rent is the first on the left and is spacious, well-lit and well-decorated; with a double bed, chests of drawers, cupboards and a working table. On the same floor is another room, locked, which contains a bed that you are free to sleep in, as entering does not count as trespassing. Esta página foi modificada pela última vez à(s) 10h48min de 3 de outubro de 2014.